Manufacturer’s Description: Bandai has taken two of the hottest trends and combined them into one fun plush collection called Poo-nicorns. These characters come in a variety of affordable plush ranging from 9cm Plushies Palz with a carabiner clip to add to bags or keyring, to 40cm Puffiez Pillows. All are complete with bold bright colours and big eyes making the quirkiest characters around. 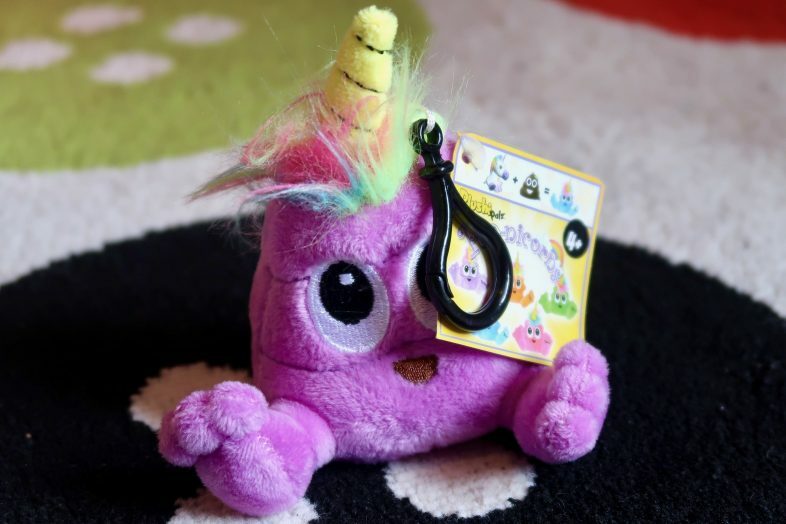 Review: An absolute genius has come up with a new fun set of characters which combines two of the most popular emojis, poo and unicorn 濾, into the ‘Poo-nicorns’ which are just wonderfully ridiculous. 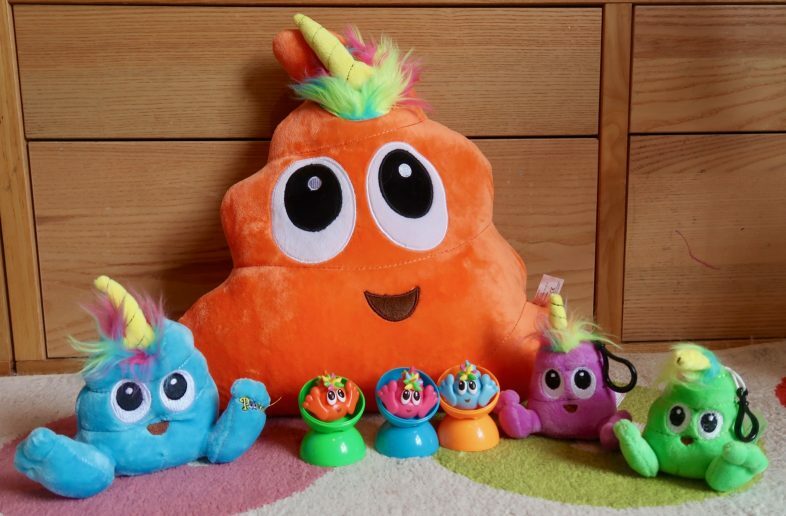 These fun and colourful characters are shaped like the now iconic Poo emoji, complete with big eyes, with the addition of fluffy rainbow hair and a unicorn horn. Poo-nicorns come in plenty of different sizes, from the teeny tiny Squishiez to the 40cm Plushiez Pillow. 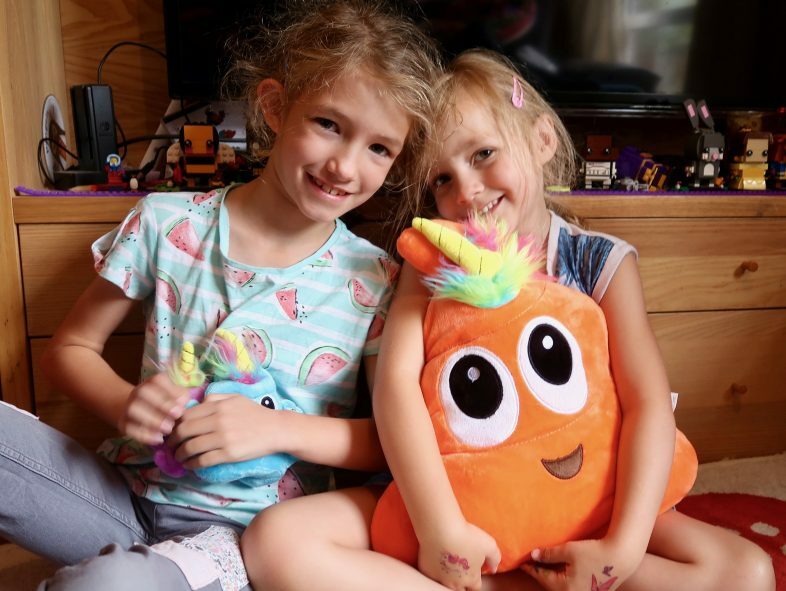 We were sent a selection of products from the range; a large orange Plushiez Pillow, a blue 15cm Plushiez, a purple 9cm Hanging Plushiez, a 6.5cm Droplingz and three Squishiez. The 9cm Hanging Plushiez are perfect as bag charms, with a black plastic clip attached to the top of their head. 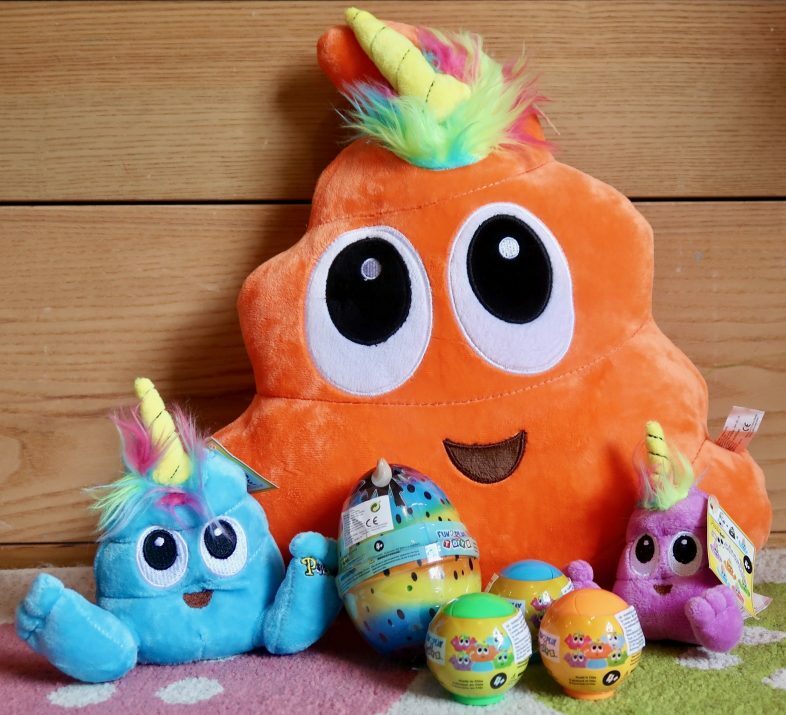 All of the soft Poo-nicorns are made with a lovely soft plush fabric, in really fun bright colours. Georgie and Lydia fell in love with these at first sight – they think they are just hilarious! 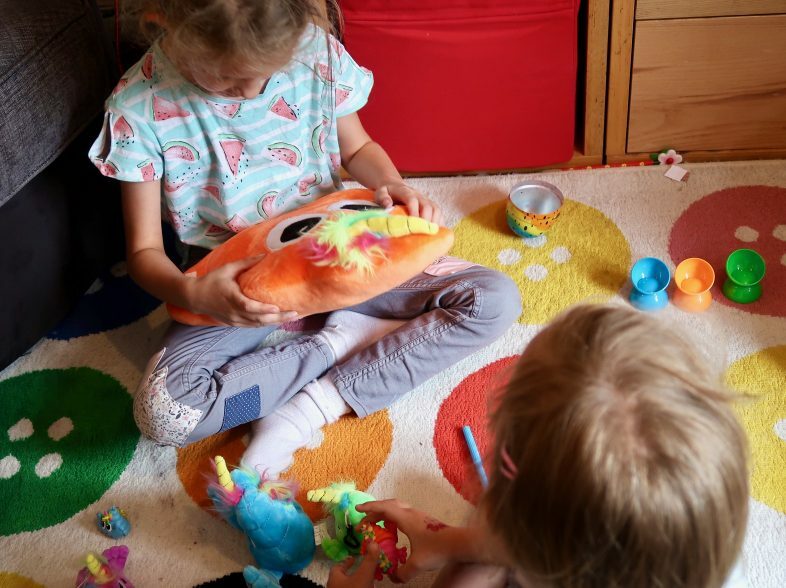 Lydia, with her love of soft furnishings, has claimed the pillow for herself – she sleeps in a nest of cushions, blankets, and soft toys, and this new Poo-nicorn Plushiez Pillow is a very welcome addition to her cosy collection. The 6.5cm Droplingz and little Squishiez come with added excitement as their contents are a mystery! 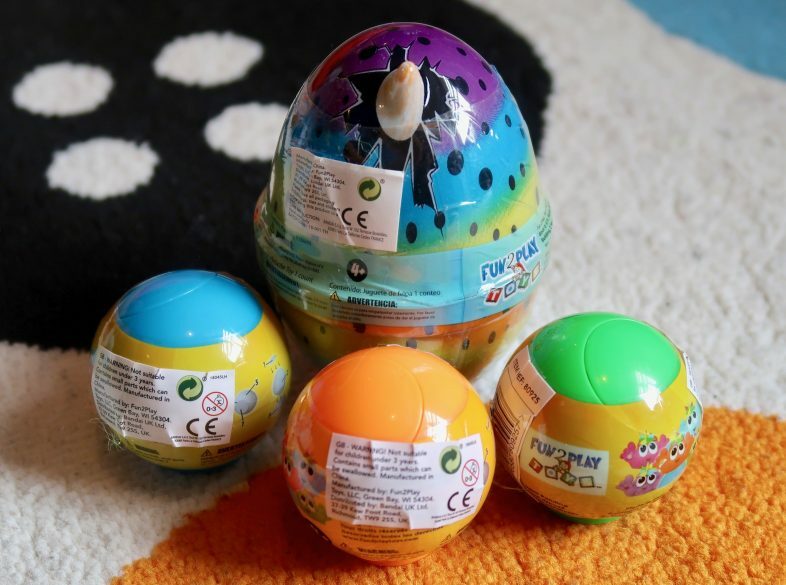 With the popularity of blind bags – which my girls adore – these products are bound to be a success. Georgie and Lydia really enjoyed breaking these open and finding which Poo-nicorns were hidden inside. 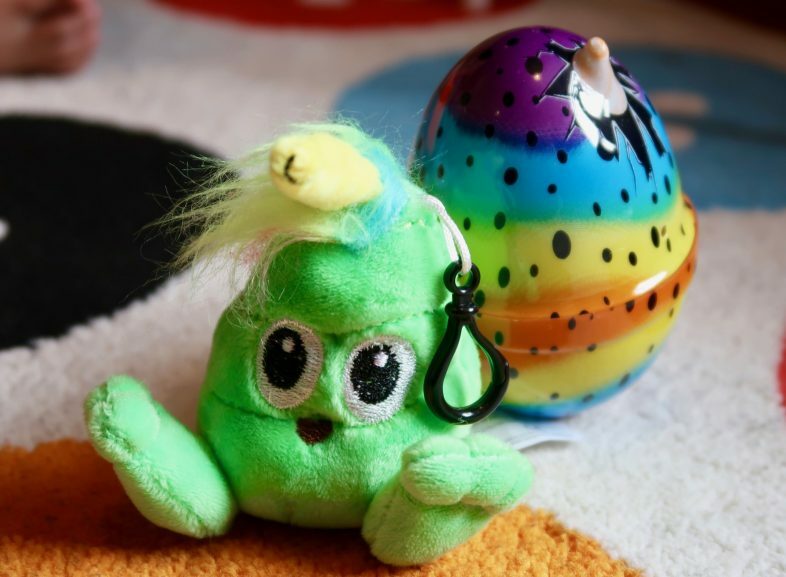 The Droplingz come in a colourful little speckled egg and have a little clip so you can attach them to zips and so on – the girls love to decorate their bags with things like this and I think this will probably be going on a school bag in September! 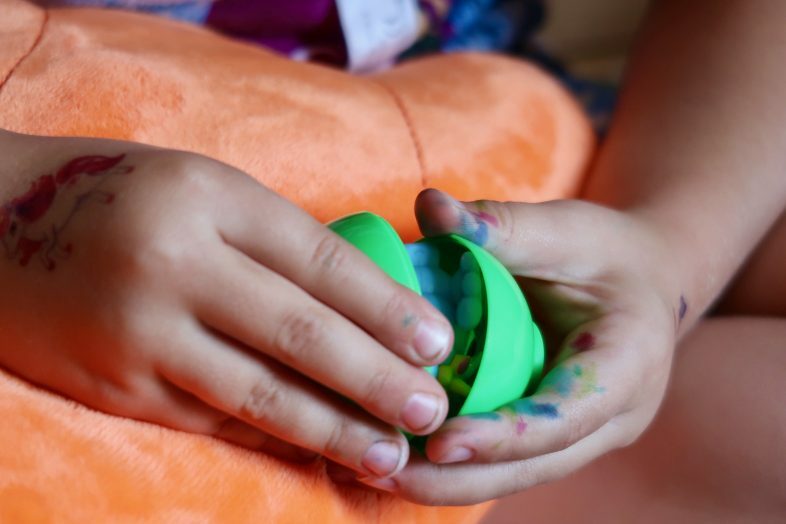 The even diddier Squishiez come in clever little plastic balls that come apart and slot together to make neat little chairs for the small squashy Poo-nicorns hidden inside. They are really cute and very tactile to play with. 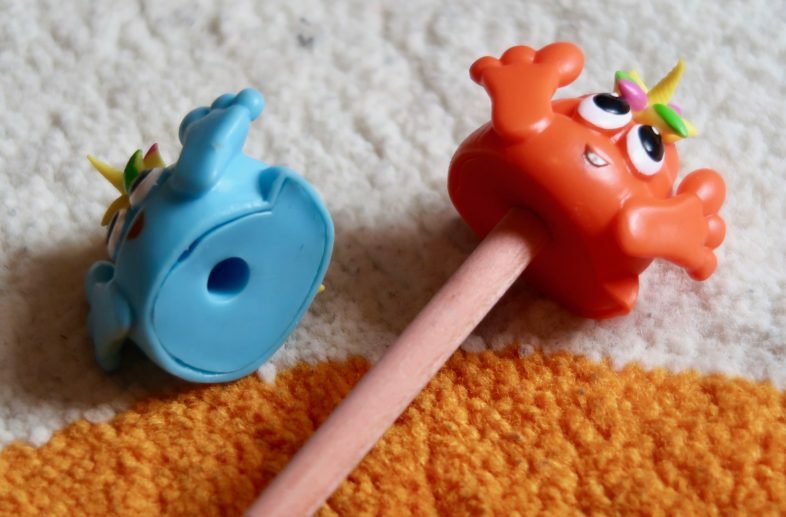 The Squishiez have a hole in their bottom which lets you use them as a pencil topper, too – bonus. As you can see, these neon coloured emoji cross breeds are awesomely ridiculous, and very quirky! The girls think they are just great, and were dancing around the room chanting “poo plus unicorn makes Poo-nicorn” and then decided to play schools with the Poo-nicorns as the students and Georgie as the teacher, followed by a game of “find the Poo-nicorn” where they took it in turns to hide them around the living room for the other to hunt. I think the prices of these products are pretty good, and they’d make fun gifts for any emoji fan (young or old )! 5 stars for these silly Poo-nicorns.